Brighton & Hove Albion will look to bounce back from their 5-0 hammering to Bournemouth when they entertain Cardiff City at the Amex on Tuesday evening. The Seagulls suffered their heaviest ever defeat at the Amex at the weekend but Albion boss Chris Hughton will be expecting a response from his side in the huge relegation clash. Cardiff are third from bottom and in the relegation zone, five points behind Brighton who are a place higher in the table. A victory would move Albion a massive step closer to safety while defeat would give Cardiff huge hope they can avoid the drop. Brighton boss Chris Hughton has several decisions to make regarding his starting line-up after Saturday's defeat to Bournemouth. Winger Anthony Knockaert is suspended after his red card against Bournemouth but Hughton otherwise has a full squad to choose from, with midfielder Pascal Gross and winger Solly March back available. The duo could come straight back into the starting line-up as Albion have missed Gross' creativity in particular in recent weeks. Glenn Murray is likely to come in up front to lead the line in place of Florin Andone, while Alireza Jahanbakhsh could return on the left wing. Albion's defence is unlikely to change too much, although Bruno and Gaetan Bong will be pushing Martin Montoya and Bernardo for a starting spot. Likely line-up: Ryan; Montoya, Duffy, Dunk, Bernardo; Stephens, Propper, Gross; March, Murray, Jahanbakhsh. Subs (from): Button, Bruno, Bong, Burn, Balogun, Kayal, Bissouma, Locadia, Izquierdo, Andone. Cardiff lost 2-0 away to Burnley on Saturday and Bluebirds boss Neil Warnock could make changes, with Oumar Niasse, Bobby De Cordova-Reid and Nathaniel Mendez-Laing the most likely to come into the starting line-up. 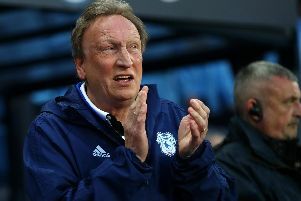 Warnock added a couple of players have knocks after Saturday and said he won't play anyone who is not 100 per cent fit. Likely line-up: Etheridge; Peltier, Morrison, Ecuele Manga, Bennett; Murphy, Gunnarsson, Arter, Camarasa, Hoilett; Niasse. Subs (from): Murphy, Cunningham, Bacuna, Ralls, De Cordova-Reid, Mendez-Laing, Zohore, Harris.